Remember this nostalgic ad by Google during the holiday season? Titled ‘HOME ALONe AGAIN’ and starring Macaulay Culkin as his character (grown up now) from the Home Alone series, the ad shows how in times of Google Assistant, being left alone at your home is not as scary as it used to be. Today it’s all about IoT and AI making us pretty much dependent on our devices for everything. But having voice assistants like Alexa, Google, and Siri, this seems to have become more convenient and more fun too. App development has seen significant benefits from voice assistants in the past year. Having Siri send messages to your contacts while you are driving or setting reminders for yourself, all this has been seen and done. But with these assistants becoming increasingly intelligent in recognizing voice commands and understanding natural languages, they are finding newer ways into our everyday lives. In May 2018, Google Assistant was available on 500 million devices. Today it is present on over 1 billion devices all over. It got doubled in just 7 months, that is how fast it is growing. Apart from making our lives easier and fun, Google Assistant shows great prospect for businesses as well. The digital age has made our world hyperconnected and riding on this tide; Google Assistant can open new avenues for enterprises. You can be available to your users at all times. No matter how and when your customer demands your presence, you will be there. Instead your Assistant will make you never seem out of reach. Thereby enhancing user experience and cultivating brand loyalty. Give your brand a voice by using Google Assistant. Ask your app developers to build actions for the Google Assistant with Actions on Google. This will allow you to connect to your users directly through voice. Let’s say you built an app for home maintenance services and a user of yours can say ‘Ok Google, Get the AC serviced’ and Google does the rest- launches the app, books the service professional by confirming the day and time you’d want the visit to be. By integrating Google Assistant into your products, you can make your operations grow. Your users can locate your stores, book appointments, buy products or anything that you can offer digitally through voice-controlled commands. The above advantages make sure your customers never give up on you because of your 24/7 availability and ease of access. There are many digital assistants available, but as of now, Google Assistant comes out to be a winner in its performance. The availability of Google Assistant is beyond geographies, languages, and devices. It has seen integration with smartphones, TVs, cars, displays, game consoles, wearables, even coffee pots! Its ability to connect to anything smart and making it smarter is what is clicking with people. Any device a modern day household is using, your app along with Google can control it. The facility is as of now available in 80 countries but not restricted to English, and comes in 30 languages. 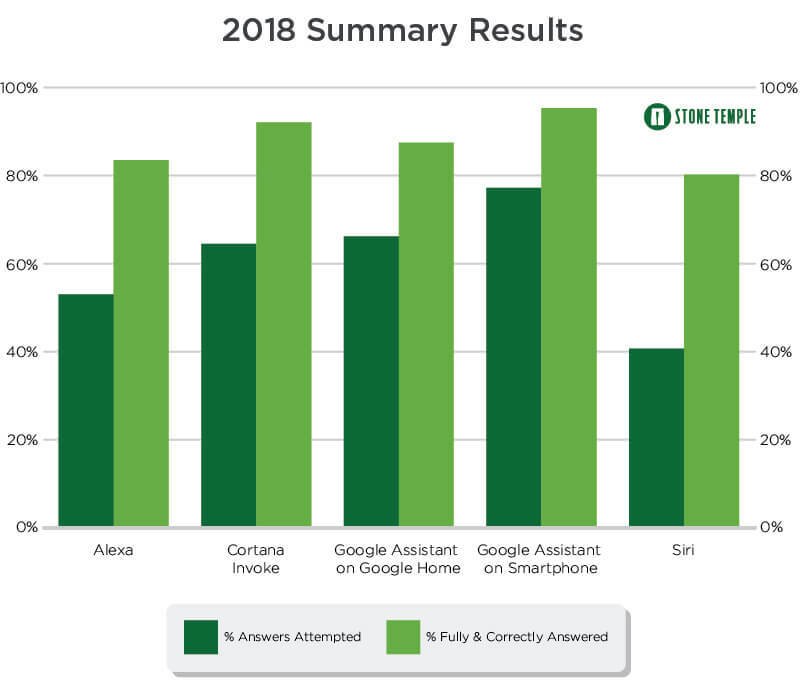 In a test of digital assistants held by Stone Temple, it was concluded that Google Assistant on (Smartphone and Home) performed better than the other voice assisted services regarding queries it took and answered accurately. It allows users to create custom Routines that make it a favorite among people. For example, when you say ‘Ok Google, party time,’ the fancy lights start flickering and your playlist of party songs is initiated. Adding your business to such Routines is going to offer a significant boost to operations and make your brand win. Google has been a favorite ever since its success as a search engine. No one Blings!, everyone just Googles. Google Assistant comes inbuilt with all Android devices, and people are extensively using it. Your brand especially, your app scores a high with the customer in the first impression if it has integration with the Google Assistant. You will be considered innovative, and people are more likely to use your services or product. Integrating your app with Google Assistant provides a billion people an opportunity to turn to your app to find answers. With that great a visibility, imagine the heights your enterprise can scale! In 2019 and beyond, we are going to see hands-free, touch-less, gesture or voice dominated actions changing the way we interact with our devices. The Google Assistant is the next thing in the tech world, and it has arrived. It is now up to businesses to make the best of this phenomenon and stay relevant.